De opere prime diei. Folium II. [The creation of the world - First day] - SCHEDEL, H.
Title : De opere prime diei. Folium II. [The creation of the world - First day]. Size : 16.5 x 11.8 inches. / 42.0 x 30.0 cm. 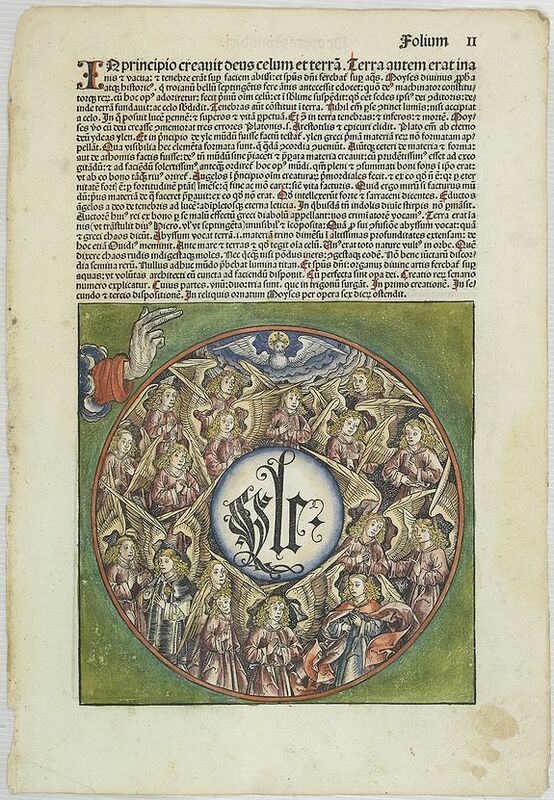 Description :Attractive page from the Liber chronicarum or Nuremberg Chronicle, showing the creation of the world: the First Day, showing the celestial choir (God's creation of the angels) surrounding the Greek word yle representing the primeval matter from which all things are made. On verso a second plate represents the division of light from darkness with two simple circles. Page from the richest illustrated Incunabula, the famous: "Nuremberg Chronicle", published the year that Columbus returned to Europe after discovering America. Condition : Marginal spotting. Upper and lower margins slightly stained.